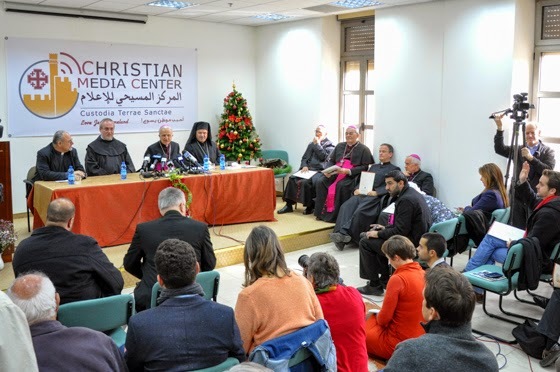 JERUSALEM – His Beatitude Fouad Twal gave his Christmas message through his Vicar in Jerusalem and Palestine, Bishop William Shomali, during the press conference which was held this Thursday, December 18 at Terra Santa College. That was also the occasion to inaugurate the new Christian Media Center (CMC). I wish you and all your loved ones a blessed Christmas! Dear journalists, in greeting you this morning, I thank you for your work and it is my hope that you will always carry it out with wisdom and in truth. Once again, I express my admiration and respect for those of you who showed great concern and courage in covering, in particular, the Visit of His Holiness Pope Francis to the Holy Land, as well as the sad events of Jerusalem and the Holy Land in the last weeks. (i) One of “the best of times” for me in the past year was the pilgrimage of the Holy Father to the Holy Land. It was successful on the pastoral and ecumenical level. His visit was followed by the beautiful prayer meeting in the Vatican gardens with President Abbas, former President Peres and Patriarch Bartolomew. Even though we did not obtain any concrete result from that meeting, however, every prayer is valid and the fruits may come much later, like the olive tree, planted on that occasion and which may produce fruits many years ahead. (ii) It is always a great joy and privilege for me to ordain men to the sacred priesthood. This year, nine were ordained. We sent two of them to serve our faithful in the Diaspora: in the Arab Emirates and California. (iii) The Synod on the Family, which convened in October in Rome, presented the opportunity to deal with the many challenges families face. It was one occasion that called for authentic wisdom and hope. The Synod reaffirmed the unity and indissolubility of the marriage institution. If there is progress to be made, it will be on the level of pastoral care toward separated couples and couples who entered into a second marriage. In this Holy Land, our main problem is on another level. Many families suffer from lack of legal documents for a couple to be able to live together when the marriage is between one Palestinian and a non-Palestinian. It is difficult, then, to obtain a visa or resident’s status for the non-Palestinian. Here we ask the Israeli government to ease the present restrictions on family reunification. We heard last week that more than 593 cases family reunification were accepted. This is a positive step that we thank for but it is far away from being enough for the big needs. (iv) We felt a great joy these past days, when the Holy Father signed a decree for the canonization of two Palestinian saints. They will be officially canonized in Rome in the coming summer. A large number of faithful will go to Rome on that occasion. Canonization is the supreme honor granted to a faithful who lived according to his or her faith, who is a model for other faithful and has a highly favored intercession. The first is Blessed Myriam Bawardi, originally from Ibillin in the Upper Galilee and foundress of the Carmel Monastery in Bethlehem. The second is Blessed Marie Alphonsine Ghattas, born in the Old City of Jerusalem and co-foundress of the Sisters of the Rosary congregation. Both saints are a source of hope for the future. We rely on their intercession for peace in the Holy Land. We condemn the Gaza war and deplore its dramatic consequences: killing and destruction; but at the same time, we condemn any category of violence and retaliation against innocent people such as the killing of people praying in a synagogue and attacks against mosques. In one week, the Christian leaders of the Holy Land visited Har Nof synagogue to condemn the inhuman act that took place there, and at the same time visited Al Aksa Mosque to ask for the old Statu Quo to be respected. Unfortunately, our beloved Holy City of Jerusalem has been flowing with blood and tears. We do not want any religious antagonism in the Holy City whose vocation is to be the city of peace and interreligious coexistence. (ii) During pastoral visits to our parishes, we could feel, touch and experience the tragedy of the many refugees from Syria and Iraq: families who lost homes, work, loved ones and relatives. It is heartbreaking to see the children running in the dust of the camp, without any goal and direction in life. Alongside the inhuman tragedy that is covering the Middle East with blood, and tearing it apart, we are all surprised that young people from Europe embrace radical ideologies and join the fight in Syria and Iraq. From another side, we are witnesses of a clearer condemnation, by Arab and Muslim leaders, of that radical religious ideology. (iii) Last week, the Catholic Assembly of the Bishops of the Holy Land issued a statement concerning the Cremisan Valley case. We hope that the Israeli High court will keep the 300 hectares of Cremisan Valley, as well as the two Salesian monasteries on the Palestinian side. Today we are anxious because the last developments of the recent hearing are giving a different signal. We are afraid that the Court might decide that the land belonging to 58 Palestinian Christian families, might be separated from Beit Jala. Such a decision will harm our community and we hope that the judges be inspired by ethical principles and not to submit to political pressure. In all our troubles and suffering, we remember with gratitude the solidarity of many people, organizations, institutions and States, who have come to our aid through many ways and means. The celebration of the Birth of Jesus promises mercy, love, and peace to countless people in their suffering and tribulation; to people who see their lives shattered and their efforts broken in the tumultuous strife and hatred of our stormy days. For our faithful of the Holy Land, our friends around the world and our beloved pilgrims, I wish you all a blessed Christmas and a new year full of peace and good health .